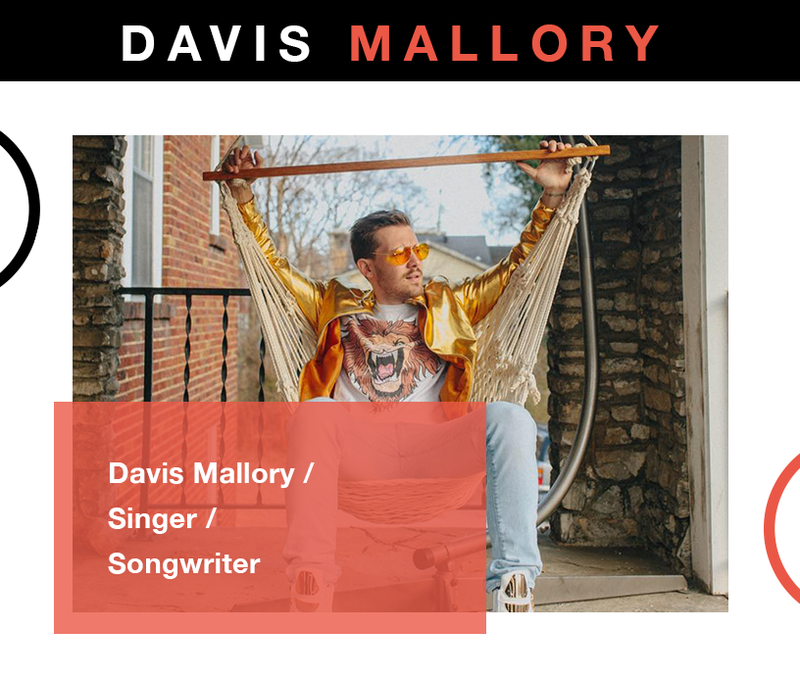 ATLANTA BORN, Davis Mallory is a singer-songwriter, DJ, actor and former reality TV-star appearing on MTV’s The Real World: Denver and three seasons of MTV's game show The Challenge. Afterwards, he moved to New York City to pursue music studying at Dubspot School of Electronic Music while working at Capitol Records in A&R/Marketing for Astralwerks Records. In 2013, Davis moved to Nashville, Tennessee to focus on writing and recording original music. He’s collaborated and released several tracks all over the world, including "Beautiful Girls (Diem's Song)" - a tribute to his MTV co-star Diem Brown who lost her battle to cancer - and Landis’ “Loud (feat Davis Mallory)" which signed to Grammy-nominated Cedric Gervais’ label Delecta, thus earning Davis a Spotlight feature on Gervais's website. Davis currently divides his time between Nashville, NYC, LA and Europe writing music for and with DJs, as well as working on his debut forthcoming album. I had my first songwriting session in 2011. I lived in Chicago and a female friend was dating a music producer named Joe Christofano. I asked her to introduce us so that I could work with him. He had several instrumentals for me to chose to write on and I wrote half of a song titled "Tomorrow" that was never released but was a great exercise in learning to topline. The lyrics are "there's something about tomorrow I know there's better days to come, I gotta put my past behind me I've got nothing to lose" - I think I was writing a letter to myself about my future in music. I topline: writing lyrics + melodies over fully finished instrumentals and when I write songs this way, I start by establishing melodies that compliment the track, then add lyrics to those melodies. Initially one word or phrase will come to my mind and I build a story around that idea. If I am a co-writer, I will sing it out loud to get feedback and approval from my collaborators, or I will email the idea to the producer of the music to get their feedback. I pride myself on being a strong melody writer, but there are times I get stumped, struggling to finish something and that's when I will reach out to one of my talented songwriter friends and ask them to help add new lyrics or new melodies to the song I'm writing. Occasionally I will go into a co-write with a hook, chorus, or song title that I have been wanting to write about, but more often songs I've written come about spontaneously inspired over new music. Where do you do your best writing and do you have a favorite tool to use? I love to go running and listen to instrumentals that I need to write on. Exercising produces endorphins and those happy feelings, while being alone without distractions, allows me to focus on songwriting and experiencing the music in a positive attitude. When I have an idea I will stop and record it into my phone. I title the voice note with the name of the instrumental that I am writing on to find it when I get to my studio. I create different melodies for Verse, Pre-Chorus, Chorus & Bridge over the instrumental to ensure that I have 3-5 unique melodies and some strong lyrics so that when I do get to my studio, most of my work is done. I work in Logic and I own a Shure SM7B microphone, Apollo Twin Duo interface and use Isotope Neutron, Melodyne, CLA Vocals as some of my plug-ins. What was the first time you recognized yourself as a songwriter? When I was young, I could never remember all the words to famous songs and I would fill in the gaps with my own lyrics. This drove my step-sister crazy, but looking back I realize this was me being a songwriter. Later in life when I lived in NYC, I surrounded myself with artists and songwriters. 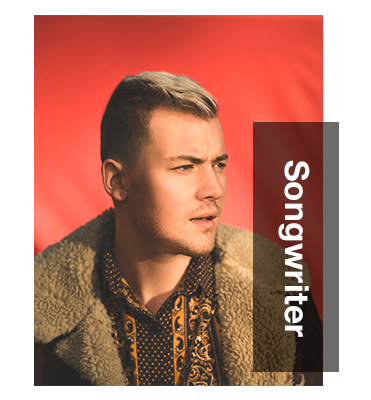 One of my first co-writers is Parson James (writer and singer of Kygo's "Stole the Show"). I went to LA for a week during the summer of 2013 with Parson and together we co-wrote seven songs. This was my first experience having someone else sing lyrics I wrote which was very validating. I moved to Nashville soon after. In my early years in Nashville, I was writing songs with really accomplished people who had #1 hit radio songs and Grammys, and I would respectfully often allow them to lead the session which I learned a lot from. It was a goal of mine though to eventually write music all by myself, to show the world what a Davis Mallory song sounds like. In 2015, I began to co-write less and write alone more. Today I pride myself in writing much of my music alone - I still often do co-writes, but I found that that when I define the vocal melodies, that they suit my voice better than when another singer creates the melody. We are all prone to writing for our voice range. Do you have a trick when you face writer’s block or get stumped when you’re writing? When I get stumped during a co-write, I will take a break - I will go on a walk or get food. When I'm in a co-write for too long and can't seem to finish a line, a bathroom break has often been the remedy to help me think of something new and complete that section. When I'm writing by myself, I will simply leave the song for a day or two and come back to it with fresh ears when I'm in the mood to write again. Is there a genre that you’d love to be more involved in? I grew up in Atlanta, Georgia and the radio stations I listened to as a child were Hip-Hop, R&B, Rap stations. I would love to venture more into that genre. I have actually never worked on music in Atlanta and I would love to get involved in the music community there. I also listened to a lot of Christian, Pop and Country music growing up. My music is mainly in Pop/Dance genre - but I would love to release in Christian and Country as well. What was the most fulfilling part of being at ADE (Amsterdam Dance Event)? I attended my first ADE in 2017 and made good use out of the $400 passes - I emailed everyone of the 4,000 delegates who were composed of music producers, artist managers, publishers, radio promoters, publicists and more. I sent them examples of my music, my bio, and asked to talk about ways to work together. This opened up so many doors for collaborations that I stayed in Europe for 2 months after ADE traveling from London to Sweden and Denmark, writing music with different producers. I wrote 25 songs and many are beginning to be released this year. It was a great decision to go and I will definitely go again! What’s your favorite live performance memory? Summer of 2017, I released my debut EP LOUD and, to promote the release, I traveled to NYC and Los Angeles and performed at nightclubs in both cities. I sang in Hollywood at Avalon Nightclub to a huge crowd during a party called TigerHeat - this was one of my favorite live shows to date as the crowd was super reactive to the music and there was a big audience! How did you find out about Songtrust? I met Mandy Aubry of Songtrust while attending Amsterdam Dance Event 2017. I had been in need of a Publishing Administrator, as several of my songs were released on labels, but I had been without this service. I loved the ease of the website - finding songs on YouTube/Spotify is a great way to identify the released music. What advice do you have for new and aspiring songwriters beginning their careers? I think co-writing with others who are accomplished is a great to learn how to write music - I learned many tricks of the trade by writing with people more experienced than myself. 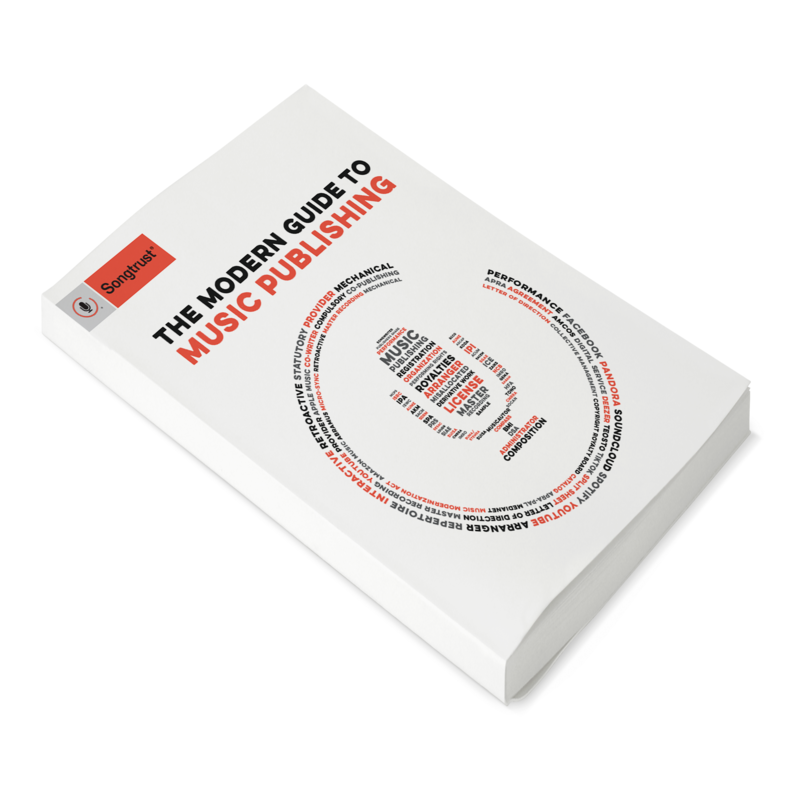 The motto it takes 1,000 hours to become a master applies to songwriting - doing it often is necessary. I have written over 300 songs in the 5 years that I have been writing music. Songwriting is a numbers game and writing often will improve your abilities and increase your success of music being released by other singers and with DJs. Today, I am in LA and met with two fellow songwriters who I really admire - Jeff Goldford and Justin Trantor. Both of them talked about the number of songs they write per week (1-2 a day) and both commiserate on the fact that many of their songs have not yet been released, but when they do it's worth the work of writing so many. I echo this sentiment. My first release for 2018 came out on the French record label, Sidekick Music, titled "Dance with Me" with French DJ/Producer Loic Penillo. The music video for "Dance With Me" was an Official Selection at Out Web Festival in LA and currently aired on MTV France, Out TV, Promo TV throughout Europe & on Revry TV in the USA. My next release titled "Let Me Go In Peace" with Indian DJ Cosmos, a duet with female artist Luma and myself, debuted at #2 on iTunes Alternative Chart in India and received support from Asia's largest music festival - Sunburn Festival. My first solo single of 2018 is "Sun & Moon" is my priority record this year as it's something I am most proud of. I have so many planned releases coming up, including a song with Russian DJ/Producer Deekey titled "Downtown (feat Davis Mallory)"; a Sony Denmark titled "Ain't Afraid" - with a producer named Dex; a track coming out with Peruvian DJ/Producer Aaron Marz titled "Lost"; a song with Italian actor turned DJ-Producer Costax/Federico Costantini and a duet song with myself and female EDM vocalist Notelle. I just released a song called "Permission" with Notelle and Nashville pop producer KELLR. I have been working locally in Nashville with pop producer Brandon Meagher and we have 2 songs on deck to follow "Sun and Moon" which I am really proud of. It will be a busy release year. As a performer I have already performed in NYC twice this year and done several shows in Nashville. I will be DJing Milwaukee Pride and singing Nashville Pride. Lastly, what is your favorite song to listen to right now? I've really been into Zayn's "Let Me," Troye Sivan's "My My My," and Clean Bandit & Demi Lovato's "Solo".